Electabuzz in game: 844 Who? Important notice! Pokemon Electabuzz is a fictional character of humans. Electabuzz is a slightly humanoid creature with a few feline traits. It is covered in yellow fur with black stripes; a large stripe on its chest is shaped like a lightning bolt. It has a long tail. There are three, clawed toes on each of its feet, two in front and one in back, while it has five fingers on each hand. Electabuzz has two sharp fangs and a pair of antennae with bulbous ends. In the dark, Electabuzz will glow a light blue with the electrical charge stored inside of it. 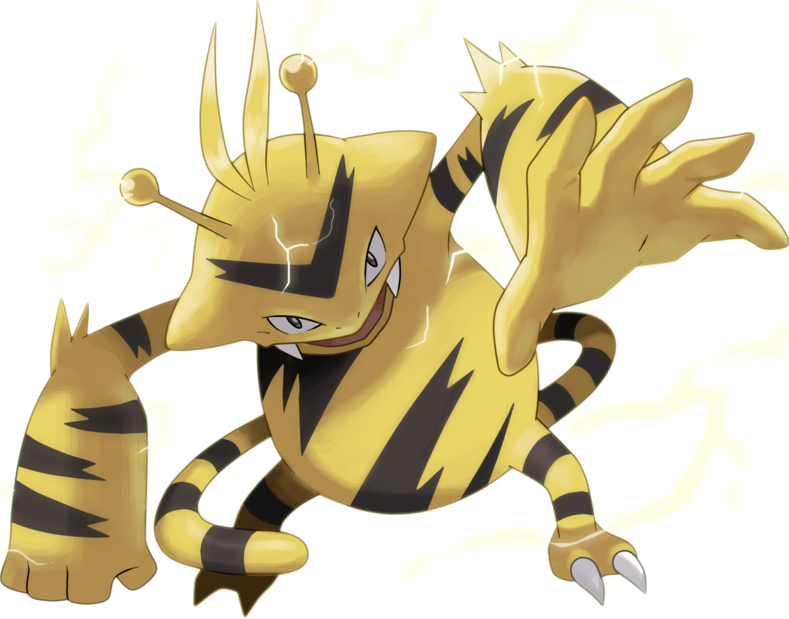 Electabuzz is capable of storing huge amounts of electrical energy inside of its body over long periods. 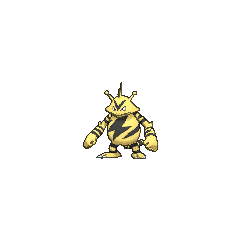 During torrential thunderstorms, Electabuzz will compete to determine which is capable of attaining the highest ground, so as to be most likely struck by a bolt of lightning. If struck, Electabuzz will absorb the electricity and will not be harmed. It is in this same manner that captured Electabuzz are sometimes used in small towns as an alternative to lightning rods. As demonstrated in the anime, Electabuzz is enraged by the color red. If this Pokémon sees the color red, it will become violent and raze the area around it. 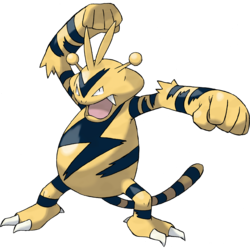 In battle, Electabuzz windmills its arms, apparently to add momentum to its punches. This method of battle seems ineffective, as its opponent has been known to escape in the meantime. It is also capable of entirely nonverbal communication via electrical currents when in close proximity to another of its species. Electabuzz typically resides in or around power plants, and can also be found in grasslands. It has been known to wander into cities and cause blackouts. In Smells Like Team Spirit, Paul's Elekid evolves into Electabuzz in the Tag Battle Competition. In Lost Leader Strategy! it was revealed that Paul had left his Electabuzz under the care of his brother, Reggie. It then returned to Paul's team after the events of Enter Galactic!. It was shown to have evolved into Electivire in Casting a Paul on Barry!. 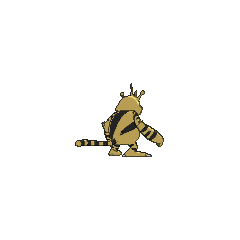 Electabuzz first appeared in Showdown at Dark City under the ownership of Kaz. It is the Kas Gym's primary Pokémon and was used in the feuds that the Kas and Yas Gyms were having. Rudy, the Trovita Island Gym Leader, used an Electabuzz against Ash's Pikachu during their Gym Battle in Misty Meets Her Match. In Enter The Dragonite, Drake, the leader of the Orange Crew, used his Electabuzz to fight Bulbasaur and Charizard. Drake's Electabuzz defeated Ash's Bulbasaur before being defeated by Ash's Charizard. An Electabuzz was the head of security in a power plant. In Current Events, it attacked Ash and his Chikorita, seeing them as intruders, but was then captured by Team Rocket. Dr. Namba owns an Electabuzz that he used in A Promise is a Promise. In Here's Looking At You, Elekid!, Casey mentions that she wants an Elekid in order to evolve it into Electabuzz, since Electabuzz is her favorite Pokémon. Macy used an Electabuzz in her Silver Conference battle against Ash in Love, Pokémon Style. 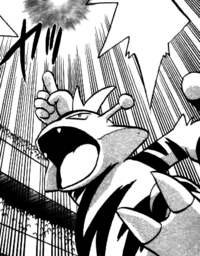 Jump used an Electabuzz in the first round of the Ever Grande Conference in Saved by the Beldum but it was defeated by Morrison's newly evolved Metang. In Riddle Me This, Electabuzz was one of the Pokémon shown in an exercise Gym. Team Rocket tried to steal the group of Fighting-type Pokémon, but were stopped by Ash and his friends. An Electabuzz appeared in Mewtwo Strikes Back and Pokémon Double Trouble. 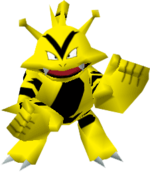 An Electabuzz was among the Pokémon controlled by Cassidy and Butch in Pikachu Re-Volts. 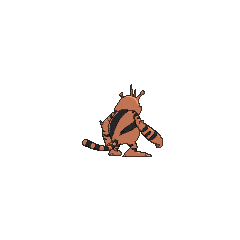 Multiple Electabuzz also appeared in The Power of One. An Electabuzz was seen in a fantasy in The Rivalry Revival. Electabuzz is one of the Electric-type Pokémon that was seen in the lake with crystal in As Clear As Crystal. An Electabuzz appeared in the opening of Lucario and the Mystery of Mew. An Electabuzz appeared in Zoroark: Master of Illusions participating in the Pokémon Baccer World Cup. A Trainer's Electabuzz appeared in The Guardian's Challenge!. EP199 Electabuzz Ash's Pokédex Electabuzz, the Electric Pokémon. Electabuzz is the evolved form of Elekid. With powerful electric currents running through its body, Electabuzz appears to glow. DP052 Electabuzz Dawn's Pokédex Electabuzz, the Electric Pokémon. An evolved form of Elekid. It appears near power generators, and because it eats electricity it can cause blackouts. Electabuzz debuts in its own round, Buzz Off, Electabuzz!, as the main Pokémon of Lt. Surge. It is so vicious that even its Trainer cannot keep it in its Ball and its ThunderPunch attack tears through ground floors like wheat. Although the most that Poli can do against it at first is freeze its feet so that Red and Poli can flee, the tables turn when Poli evolves into Poliwrath and throws Electabuzz and its Trainer both off the ship. The same Electabuzz later appears to fight Morty's Misdreavus, but while its continuous Thunder attacks do a number, the ghost's Pain Split and Spite leave it unable to attack. Another Electabuzz appears as a silhouette when Green explains something to Red about Mew in The Jynx Jinx. An Electabuzz appears in A Flaaffy Kerfuffle where it is one of the Pokémon in Professor Oak's fantasy as he explains that trainers should only have six Pokémon with them. Magmar and Electabuzz seem to be counterparts; both evolve in a very similar way (first at level 30, then after being traded holding an item which has a name that ends with the suffix "-izer"), and both are typically exclusive to one version of a pair of games. They both have similar status-inducing Abilities in Flame Body and Static, as well as the same Hidden Ability, Vital Spirit. They also learn all their moves at the same levels, such as Fire Punch and Thunder Punch at Level 29. They even have the same special moves when purified in Pokémon XD: Follow Me and Cross Chop. Their pre-evolutions and evolutions were released in the same generation (Generation II and IV). Additionally, their Japanese names are essentially phonetic reversals of each other. Cantonese Chinese 電擊獸 Dihngīksau Literally "Electric shock beast"